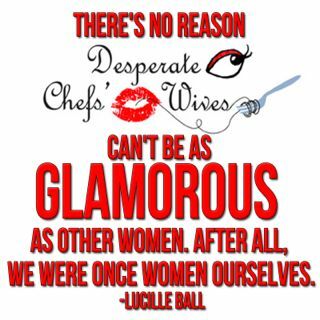 Desperate Chefs' Wives: I'm Not Perfect! 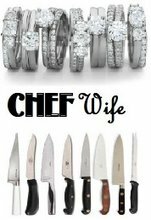 It has been two years this month that I started The Desperate Chefs' Wives blog and I am so pleased with where it has taken me. I used to be such a grouchy, angry chefwife and I thought my life was something terrible. Well, after meeting other women who have the same life I realized that I can either be miserable or create a new normal. My new normal is that my husband works nights, weekends, and holidays and that's it. Period. I've accepted it. BUT. I'm still not perfect. 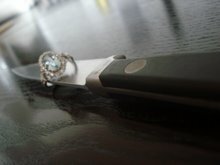 My husband's sous chef is taking two weeks off in July to get married. So Erik has to work 17 doubles in a row-no weekends. I'm so livid with this whole situation. I'm angry that there is no one else who can help my husband at the restaurant and I'm annoyed that I have to deal with an overworked-underpaid chef for 17 days in a row. Last night, Erik was asking me why can't I just be supportive, like I usually am? I don't know. Perhaps it's because I'm not perfect. I can only smile so much, blog so many times, spend time alone so many nights before it all catches up to me. Erik might as well be on another planet for 17 days because there is no way I'll ever see him. He'll leave every day at 9 and get home at 1 AM or later. On top of that, I only work part-time at the school in the summer so I don't have many work things to occupy my time. I just don't think I'm going to be able to handle it this time. Why don't you think of a really cool project you've always wanted to do? Or go to the pool every day, catch up with friends you never see, making a reading list? I know it doesn't feel better, but it always helps to be busy. =) Good luck! I feel your pain! 17 days in a row is a lot for anyone. It's hard because we know what we "should" do to keep ourselves busy, and also support a very weary and overworked husband. But sometimes the weight of juggling a chef husband and all of the incongruencies of their schedule and work life can just be too much. Last summer, my husband worked 13 days in a row. I ended up packing the dog and the kid in the car and went on a long weekend trip to the coast. It helped to break up the week and 13 days ended up not feeling so long. My husband enjoyed the quite time at home and he caught up on some much needed rest. I know where you're coming from! Tonight is my chef's first opening night of his restaurant. I'd be more excited if it meant we'd be spending more time together - but I know it won't be like that for a few months. So I'll be thinking of you on my nights alone and thank you for the blog over the past few months, it's been a real lifesaver. Hi Hilary...I feel ya and yet if I've learned anything in the 10 years I've been doing this, you have to move ahead with your daily life. If you don't have enough to do, than YOU need to find more to do! It's lonely, I know...but take this time to go the things that (if you have kids someday) you will NEVER be able to do again. There will always be times of many many doubles or when opening a new place puts you way down his list of priorities...but for me I had to keep going with my own career, friends, travel...you can do all that all still love, support and be a good wife. When my kids came I realized when a new place was being opened that my kids summer couldn't end due to this restaurant or a career choice that he made long before any of us came. I would load the kids in the car, drop him at work by 9am and make the most fun of the beach or zoo or a weekend trip that I could...then hear him creep in at 2am and the next day would start just the same. This went on for months...But I will say, after 10 years of this and 2 kids having the "novelty" of the chef thing is worn off and no longer do I worry about his schedule or which sous is off, god I practically don't even know the names of the people he works with...my point is now I'm "his wife" and not the "chefs wife"...but it took a long time and tears and fights and kids to get here. Your blog is great...keep it up and there are women out there who care and are so happy to listen! I hear you -- my chef recently started working 3PM to 3AM a few nights/week, and even that brief stretch took its toll on me. I literally thought our relationship was falling apart because of it. Of course, that's just me getting all up in my head about the situation, whereas it's just another work day for him, no different than my 9-6. It's all about the little things and communicating when you can. Make sure he's doing his part to check in with you, whether it's a quick text, post-it on the counter, etc. Something as simple as that certainly eases the "burden" of being home alone night after night, not even feeling like you have a companion/husband anymore. 17 days is a ridiculous length of time, but I do hope it goes as smoothly as possible. I am definitely one to over-analyze the situation and tend to overwhelm myself with hatred and angst.. when he's just doing what needs to be done. I never considered myself a needy individual, but man, their schedules take a toll and made me think otherwise for the first time in my life! I definitely take great strides into making sure I'm doing activities I love and getting things done that I want to accomplish. Good luck Hilary, stay strong -- you've got this..! 17 days is brutal, to both of you! Any chance you can pop out to Ohio for some of that to help break it up? Hang in there! We're here for you. 17 days is brutal. My chef had to work 16 14-hour days in a row just to get his week vacation that he earned 6 months ago. Unfortunately, this is becoming pretty normal for my chef--although it's usally somewhere between 12-14 days in a row. It has been really tough for us this year, but we're making it. You will too! Have you thought about volunteering somewhere? Or spend the 17 days watching an old tv show on dvd? You write so well, maybe it's time to think about a manuscript? Just some suggestions. We're here for you! I just literally started to tear up when I found this blog. I am not alone! I've been feeling so crazy all of the time. I leave the house before DH and our son (4)get up in the morning, and Mr. Chef gets home long long after we've gone to bed. I think they see each other from 8am to 9am, when our child care arrives and he leaves the house. Which is exactly one hour more than I see Chef! I feel like a working single parent with mysterious amounts of extra income and laundry. My social life is ZERO offline. (I used to be able to dash out and see him whenever, wherever, before we had our son!) I can't wait to read this blog!